Facts about Prickly Dogfish Shark, "Scientific name for Prickly Dogfish Shark is Squalus acanthias". Prickly Dogfish Sharks live in temperate waters of Australia and New Zealand. 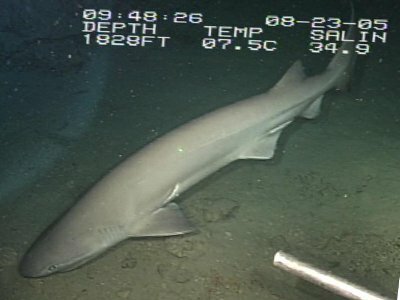 Not much is known of this shark but it lives in deep water. The people of New Zealand refer it at times as the rough shark because it has a very rough skin. Prickly Dogfish Shark is a member of Oxynotus genus which is among the family of Angular Rough Sharks. It has a very chubby, curious and an appearance that look like a cartoon. This distinguishes it from other sharks. Prickly dogfish shark has a luminous eyes or mucus that it uses to attract its prey. But due to it hump shape it is believed to have a lot of energy while swimming and that how it manages to stay deep into the ocean. Not much is known about the Prickly Dogfish Shark biology especially the feeding behavior but it is suspected to feed on fish and invertebrates. Just like other sharks the Prickly Dogfish Shark has an ovoviviparous breeding system meaning the eggs grow in the mother’s body. It has a very low productivity but it carries 7 to 8 embryos at a time. The embryos are divided into the right and left uterus. They are 9 1/2 inches (24 cm) long at birth. This shark is not harmful and has no commercial uses. There are over 400 types of sharks, Sharks have the most powerful jaws on on earth. Prickly Dogfish Sharks jaws, both the upper and lower jaws move. Prickly Dogfish Sharks skin is made of denticles instead of scales like other fish. The denticles are constructed like hard, sharp teeth (tooth-like projection) and this helps to protect the Prickly Dogfish Shark from being injury. The Prickly Dogfish Shark is carnivores meaning: an animal that feeds on flesh (Meat).